We drove over the NSW border to a rest area and small town called Henty. This sign was at the rest area plus the sculpture. 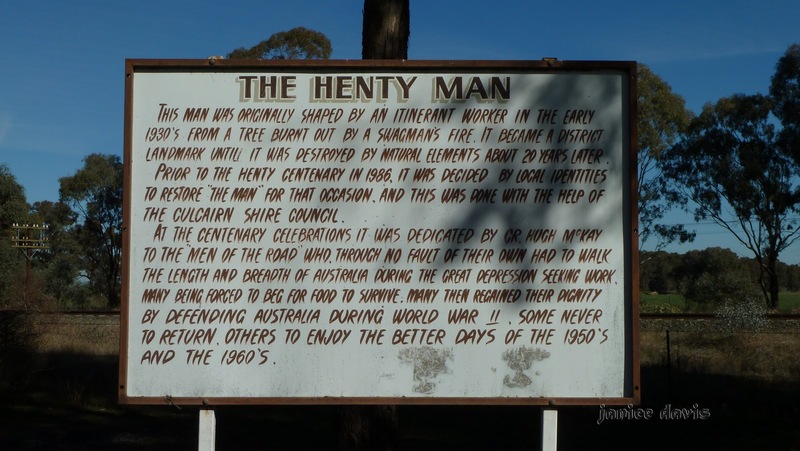 If you click on 'The Henty Man it will be larger so you can read it if you wish. The first European explorer to visit and record the area was Major Thomas Mitchell in 1835. The first settlers arrived around 1850 were squatters, allowed to lease crown land. The area was known as 'Dudal Comer', Aboriginal for 'Sweet Water', with the first property station taking this name. The village of Henty was originally called Doodle Cooma. Nearby wetlands are still called Doodle Cooma Swamp; they cover 20 square kilometres and are a breeding area for water birds. The post office changed it's name in 11886 as the railway station's name was thought to be confused with Cooma in the Monaro district. The town's new name was after the Henty family of Portland, Victoria and Launceston, Tasmania. Henry Henty has leased Round Hill station north of Gerogery (south of Henty) in the early 1860s (some suggest the lessor was Edward Henty). Amazing when researching how connections fit - I live in Launceston Tasmania and here it's mentioned about Henty. Typical of some rest areas the sheltered table and chairs. Old Machinery to look at if you wish to stop. 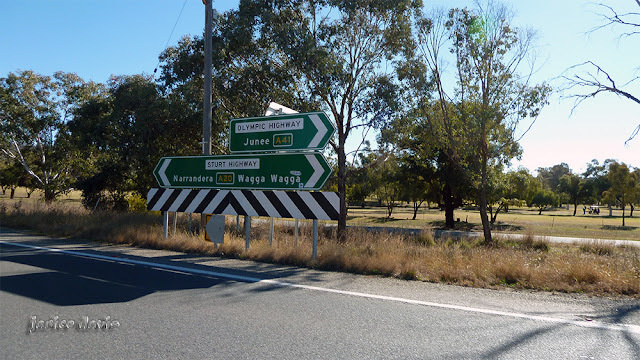 Seeing as we didn't know where we wanted to go we took the left turn to Junee, and Wagga Wagga. Confortable área de descanso e donde parar a tomar unas bebidas y proseguir después el descanso tŕás el descanso preceptivo después de las dos horas de conducción. Thank goodness for these rest areas they are very handy to pull into one and have a rest as you say. neat that they wanted to remake "him"
It certainly is as it's part of the history of that area. I learn things from your posts, I've never heard of Henty or the story of the man and I've travelled that area a fair bit in the past. If we had not have stopped we wouldn't have know anything either Merle. Each place has a story but we don't always know it. Blink and you would miss Henty when driving through. The old farm machinery yard would be interesting to explore. Well nearly miss it Colin :) The machinery, there were two lots but we didn't look any further at it having seen it before. Good to learn some Henty history. I knew they were from Portland and Tasmania. So, Cooma means water. Well you knew more than I did Andrew until we stopped. Many interesting places there--- MANY! I never knew about the Henty Man. Doodle Cooma is the sort of place name that puts a smile on my face, because it's unusual. Oh yes we sure have some names that can put a smile on of face and I wonder why places were named as creeks are too. Um local fabuloso para descansar. Bom fim de semana. Felicidades. Always need a rest somewhere so it's lovely to find a nice friendly place. Oh that signboard has quite sad stuff to share! i like the place with peace and less crowed , i am glad that you enjoyed your visit and food there dear friend! 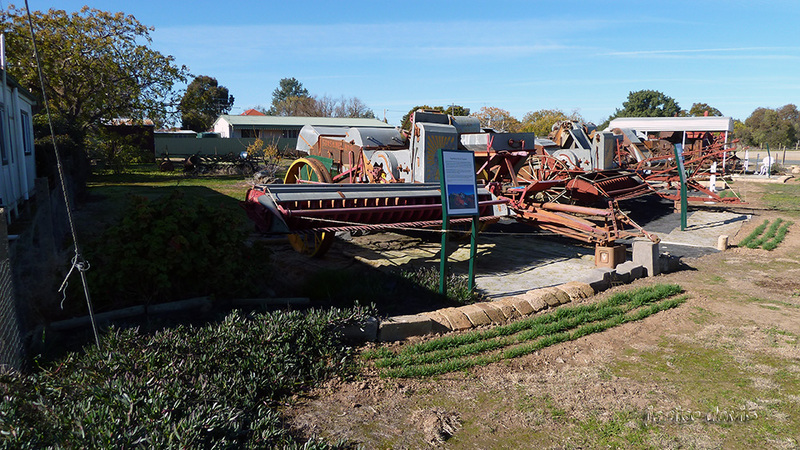 Many towns put old machinery in paddocks or near the road for all to view. 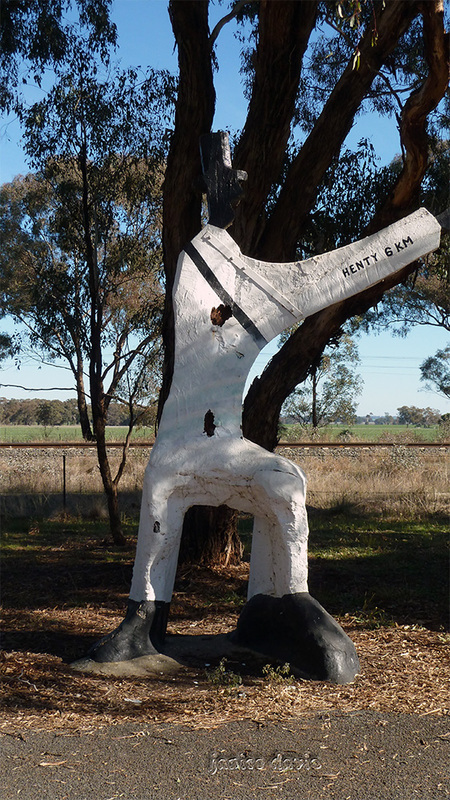 Interesting facts about Henty. A town that I haven't heard of before. Some of these smaller towns are often interesting, it's just the matter of stopping sometimes. Henty is also the home of one of the largest agricultural field days in Australia. If you had of come through there during the particular 3 days in September your journey would been at a crawl! Now you've said that I recall there was a sign somewhere telling the dates of that event. 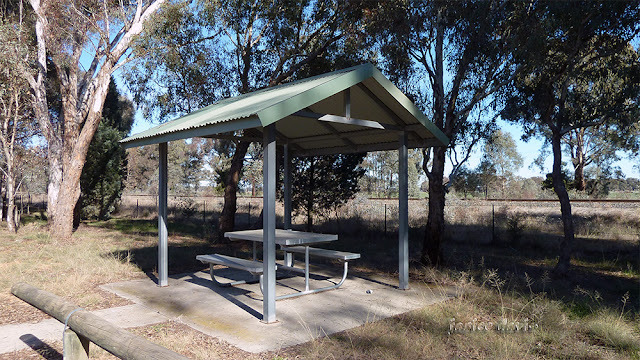 How wonderful to have the sheltered tables in rest areas! I always enjoy the way you delve into the history of an area, Margaret. Thanks Jean. Every place has history sometimes it's hard to find though.